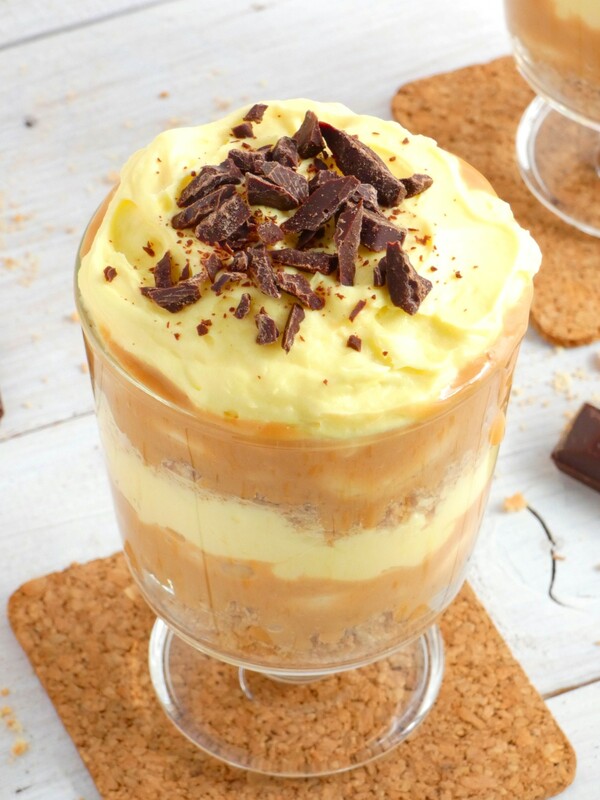 Banoffee! The world’s famous banoffee! 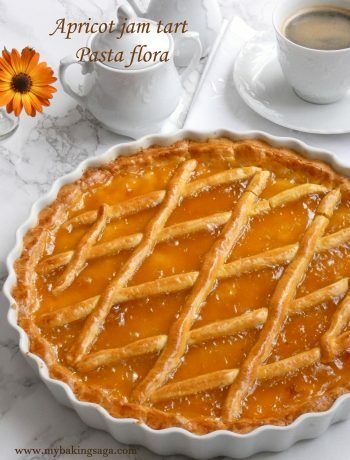 A dessert that needs no presentation since for the most of you it is already one of your favorite desserts. I am not an exception. It is certainly in my top three favorite desserts too. How can’t it be? Can anyone of you resist to banana and caramel combination? Can anyone of you resist to a velvety sweet pastry cream and crunchy buttery cookies? 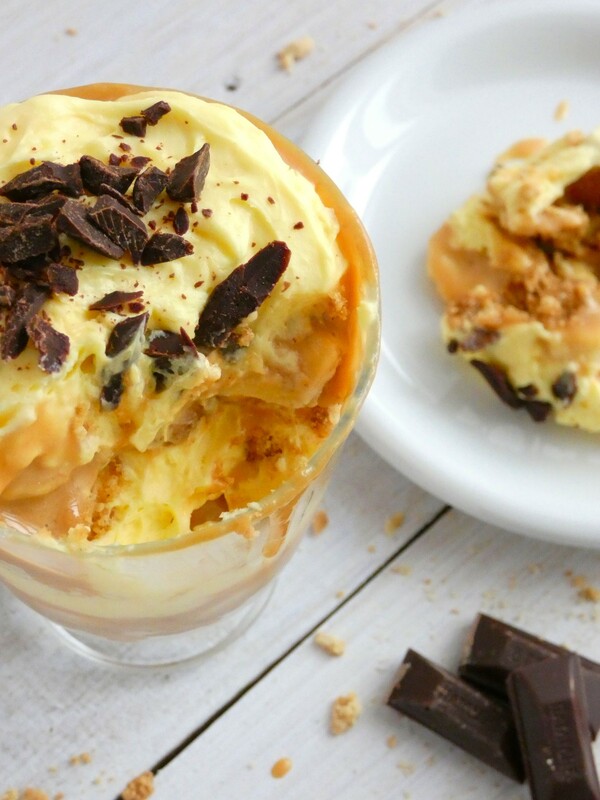 Banoffee is an English dessert and in its original form is a pie with cookie crumbs or shortcrust pastry base, a layer of banana with caramel sauce and whipping cream on the top. I didn’t go with the original recipe but I preferred to transform it to a trifle. In many mini trifles actually. I made layers of these delicious ingredients in a glass. It is not an innovation of course. I have seen it a lot in many websites and recipe books and I like it better this way. It is not only easier to serve but more attractive too. 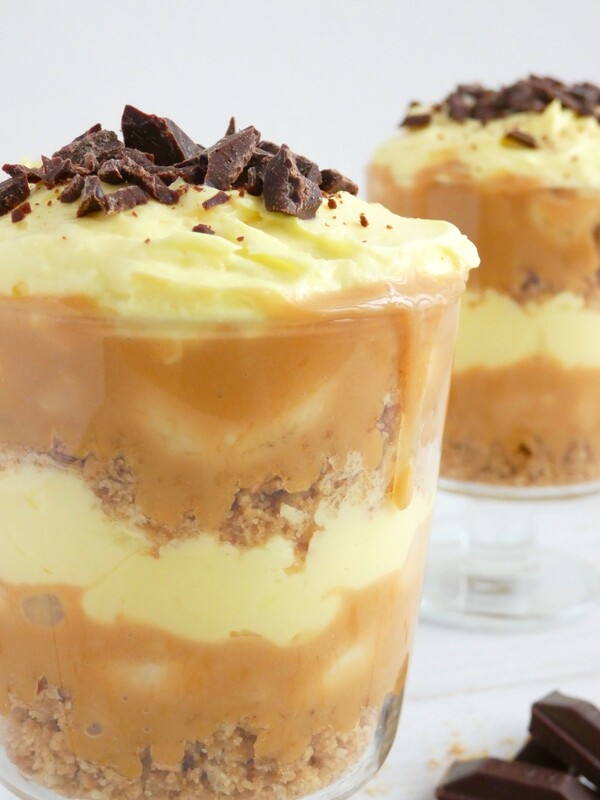 Seeing the layers of caramel and cream makes the desire stronger. Don’t you think ? Preparation and assembling is a very simple procedure. The only thing that needs an effort is making the pastry cream. I didn’t want to use just whipping cream (I an not a huge fan) so I made pastry cream and in order to make it light and airy I fold in about the same amount of sweetened whipping cream. Maybe it is more time consuming this way but it is a lot yummier. The rest is just a piece of cake. Digestive biscuit crumbs mixed with melted butter for the base layer and banana slices mixed with caramel sauce for the second layer. Now you have three different mixtures. 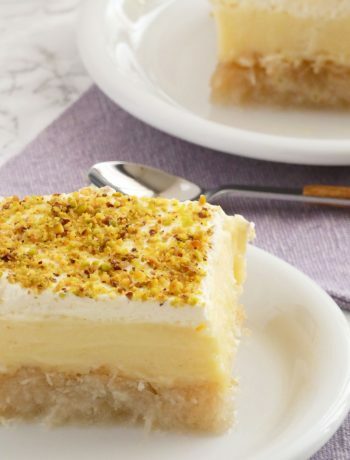 Make layers of them in a glass and this super tasty dessert is ready. So easy. The caramel sauce is used for banoffe is in fact dulce de leche. Caramelized sweetened condensed milk. It is easy to make dulce de leche by yourself but it is easier to buy it from the supermarket and that is exactly what I did. I was searching for a long time to find dulce de leche in our local market but I couldn’t. We are a small town you see and some things is difficult to find. So when sometime before Christmas I finally saw it on the shelf I was sure about what I was going to do with it. There was no doubt in my mind that banoffee will be. And if I can find ready made dulce de leche in my small town I am sure that you can find too. It will make your life a lot easier. Sometimes happiness is hiding in small things. 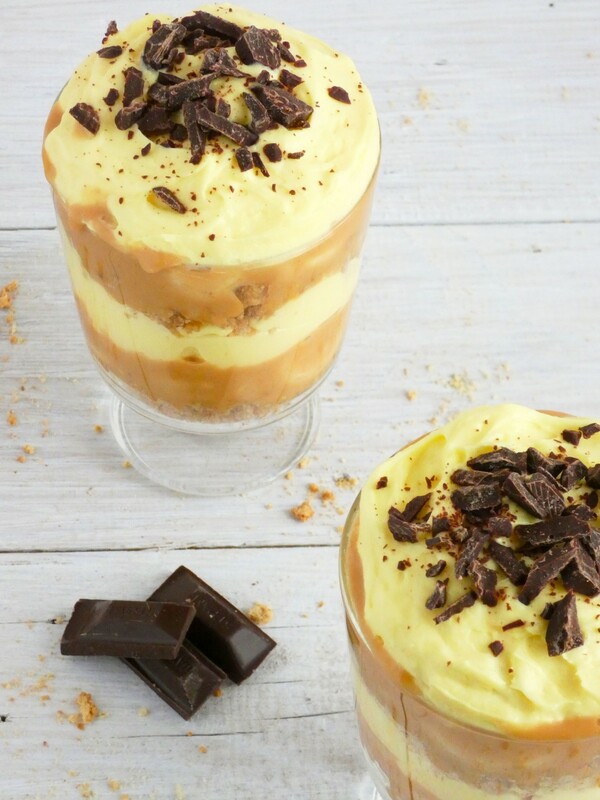 Enjoying a heavenly delicious dessert like banoffee is definitely a moment of happiness in our life! Put the milk and the half amount of the sugar into a saucepan and bring to a boil over medium heat. Meanwhile in a big bowl whisk the egg and the egg yolks for 1 minute. Add the remaining sugar and whisk until light and fluffy. Add the corn starch and mix to incorporate. Slowly pour a very little amount of the hot milk into the egg mixture, whisking constantly. Continue mixing in the milk in small amounts until all the milk is over. Transfer the mixture back into the saucepan and whisk constantly over medium heat, until the cream thickens and reaches a boil. Be careful because in some point the mixture will thicken suddenly. You just have to whisk vigorously and continuously so the cream to be smooth and with no lumps. Mix in the vanilla extract and the butter. Let it cool at room temperature whisking often to avoid a skin forming. Put the cooled pastry cream in a big bowl. Gently fold in the sweetened whipping cream in small amounts. Set aside. Crumble the digestive biscuits. We don't want to be like sand. Let some small pieces in it. Add the melted butter and mix with your hands so the butter covers all the crumbs. Set aside. Peel the bananas and slice to thin pieces. Add the lemon juice. Add the dulce de leche and mix well. Set aside. Take 8 glasses (230ml capacity) and start making layers. Divide half of the biscuit crumbs to the 8 glasses. Add the half amount of banana-caramel mixture over the crumbs the same way (dividing equally to glasses). Continue with the half amount of pastry cream. Repeat the layers once more with the rest of the ingredients. 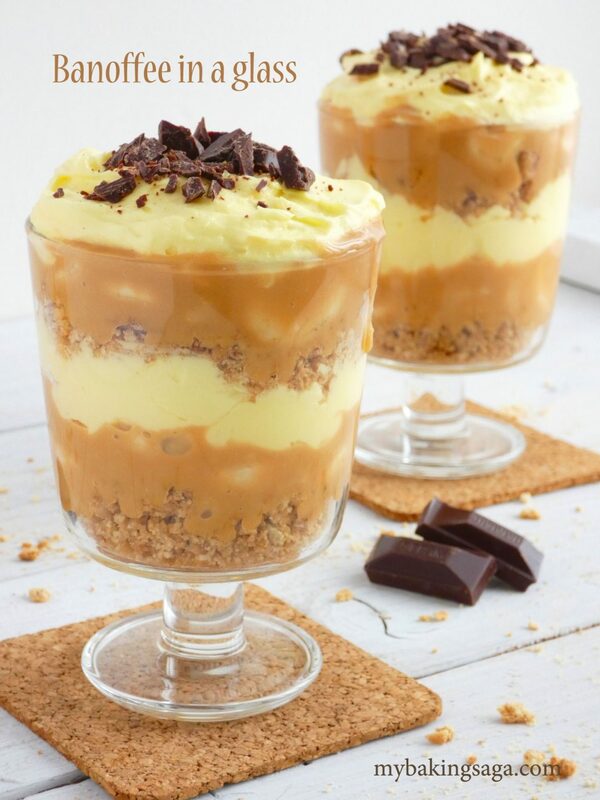 Crumbs, banana-caramel, pastry cream. Garnish with finely chopped chocolate.